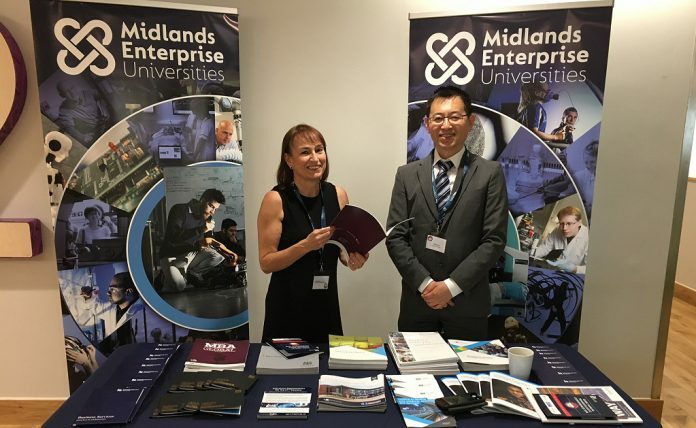 Jenny Kenning and Dr Yanguo Jing from Coventry University at an event promoting Midlands Enterprise Universities. PR, marketing and digital agency Shooting Star has strengthened its roster of public sector clients by securing a comms and stakeholder engagement contract with Midlands Enterprise Universities. Shooting Star, based in Lincoln, won a three-way pitch following a competitive tender process with MEU. The agency will work with MEU for the next ten months to raise the profile of the organisation and improve communication between MEU and its key stakeholders. The consortium is made up of six Midlands universities – Birmingham City, Coventry, Derby, Lincoln, Nottingham Trent and Wolverhampton – working together to help the Midlands Engine to deliver the Government’s Industrial Strategy. Shooting Star has extensive experience in the higher education sector, having worked for many years with both the University of Lincoln and Bishop Grosseteste University. It is also currently retained by both the Greater Lincolnshire Local Enterprise Partnership and the Midlands Engine. “This was a great contract to win and we’re very pleased that Jenny and her colleagues at MEU chose us as the agency to take their project forward,” said Jez Ashberry, one of the directors of Shooting Star. “Over the last 12 years we’ve worked extensively in the public sector, with local government and in higher education, so we feel well equipped to deliver on what MEU needs over the next year. Jenny Kenning, Director of MEU, said: “Midlands Enterprise Universities are delighted to be working with Shooting Star. They have demonstrated that they understand our aims as a group of civic minded universities, and they have strong connections with many of our key stakeholders.